Casa con 3 camere da letto elegantemente rinnovata, situata nello Storybook Capital of America ufficiale! Posizionato a pochi passi dal Taylor County Expo Center, dallo Shotwell Stadium, dallo zoo di Abilene e da Lyle Land & Cattle ea pochi minuti dall'aeroporto di Abilene. Completamente arredato, accogliente e perfettamente situato come la vostra casa lontano da casa mentre siete in Abilene per i vostri eventi speciali presso l'Expo Center, Convention Center, evento sportivo, laurea, riunione del college, festival CALF, rodeo, o vacanza in famiglia. Noleggiando la casa, gli ospiti hanno accesso completo a cucina, frigorifero, lavatrice e asciugatrice, spazi abitativi, TV e parcheggio. Il garage è stato trasformato in una sala da musica - con divani, una TV aggiuntiva e un pianoforte. C'è anche una vasca idromassaggio nel bagno padronale. Questa proprietà è la residenza del proprietario e lui e i suoi figli vivono lì nelle settimane fuori casa quando la casa non viene affittata. Si divertono a creare uno spazio molto accogliente e invitante per gli ospiti! * Il nostro adorabile cane di famiglia, Nash, vive felicemente nel cortile sul retro. Non gli è permesso entrare. È un amante della gente e ama l'attenzione se ti piace un buon vecchio gioco di recupero! Tutte le famiglie che sono rimaste a Summoner commentano sempre quanto i bambini adoravano giocare con Nash. Se sei allergico ai cani o hai bambini che hanno paura dei cani, Nash ha un altro posto dove andare e può andare in vacanza alla pecorina mentre sei lì. Fammelo sapere. We had a great time and enjoyed our stay! The house was very clean and the beds were comfortable. Brandon was easy to communicate with and his dog Nash was so friendly. Thanks again for making our trip to Abilene a memorable one. After flying in to Dallas for a wedding, I arranged to have a few more days in Texas to visit with family from Lubbock. Abilene was halfway between us, and the Sanctuary was the perfect place to spend a few days! We thoroughly enjoyed our stay in Brandon's home. The house is lovely, quiet, beautifully decorated, and provided ample room for two adults and two teens. The big screen TV was great for March Madness, and we enjoyed checking out the sites and restaurants of Abilene. Brandon was a great host, offering a warm welcome, tourist info, and many little things that made our stay more comfortable and fun. Nash (the dog) was delightful, but stays outdoors in case you are not a dog person. This was so much nicer than staying in a hotel, and we would definitely stay here again if we return to Abilene. We highly recommend it! Thank you, Cathi! You guys were such perfect guests. Thanks for coming and please come back any time! Doing vacation rental is made so much more enjoyable by meeting amazing people like you! Thank you, Kristy! Guests like you are are why I love renting. Thank you for being amazing! Our first experience using VRBO and we will definitely be using it again. We were so pleased with this place, it was everything we were looking for. We picked Abilene as a middle point to meet for a special weekend between our family and a family very dear to us. We had not see each other in months and just want it a quiet place that we can spend quality time together. This home is a real "sanctuary", the perfect home away from home!! Brandon the owner of the property was so nice, helpful and accommodating. His hospitality made us feel so welcome. He also provided recommendations on places to dine and it was spot on! This is also the perfect place to stay in, cook together, relax and watch a movie, just as you would do in your own home. We absolutely loved the home décor. The mixture of things made it so much more interesting and they work so nicely together. The music room was a hit for our two boys 12 years of age. They loved having their own place to play, relax and enjoy games. The location is perfect, we visit the zoo at just 3 minutes away and restaurants downtown are also very near by. If we ever go back to Abilene, we know were to stay! It was truly a pleasure to meet you guys, Rosa. I loved that my home could be home for you this weekend during your reunion with friends. Thank you for being wonderful guests and loving Nash. I hope our paths cross again! My best to all of you! Great place to celebrate family Christmas! The house was a great fit for us. We had family come into town to celebrate Christmas. It was beautifully decorated for the holiday and clean. It was ready for our checkin even before the scheduled check-in time and the owner was great to let us know. Communicating with the owner was easy. There were a lot of breakable decorations in the main part of the house, but the owner informed us of this ahead of time. We spent most of our time hanging out in the media/music room as we found it more cozy with carpet and areas for the kids to play without having to worry about the breakable decorations. We are also big college football fans, and were surprised that the house didn’t have ESPN where all the bowl games were played. We just didn’t think to ask about this ahead of time. However with the TV in the media room, we were able to connect through Roku and our personal Suddenlink acct. We cooked all our meals here as well. We found some of the pots/pans limited for what we needed as we made our Christmas meal, but we improvised and it worked out. Overall, it was a great experience and we would recommend this house. 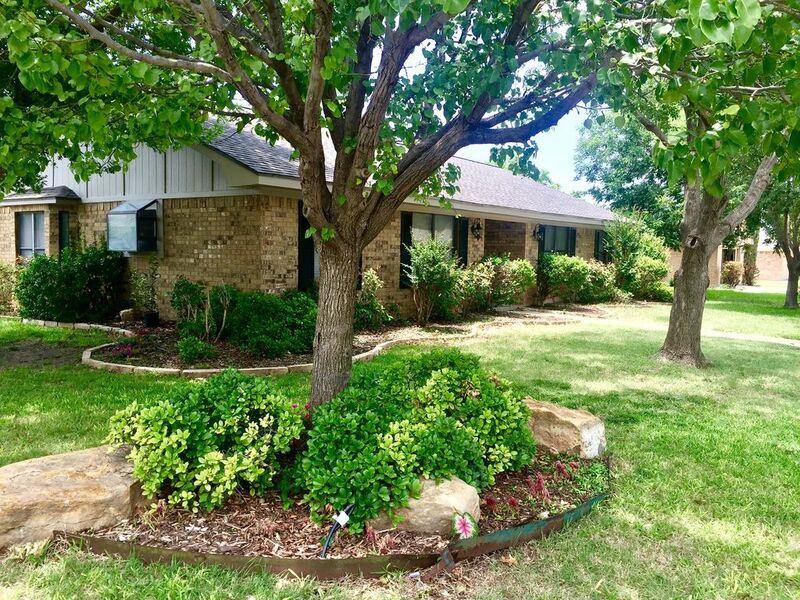 Our family wanted a quiet retreat for a two night visit to Abilene, and that is exactly what this property offers. Walking into it, the lamps were lit and inviting. You can tell the owner cares about this home. It is nicely-appointed and updated with lovely interior design features, and very clean, which we appreciated. The owner was thoughtful in having bottled water (so necessary in this 100 degree heat) and snacks available. He was easy to contact and helpful. The first night, we were able to get in a quick swim under the stars, with the very friendly Nash sitting on the deck, high-fiving us with his paw. He is the on-site dog who enjoys playing fetch. The home was close to everything; nothing was further than 15 min away, from Primetime Entertainment to The Mill (wine/beer with live music and peaceful green vines outside), Abuelo's to the Taylor Co. Taphouse to Miguel's to the fun putt-putt golf course, or even coffee and dry goods downtown. Never bother with a hotel or motel when you can stay in a spacious, quiet home like this.